Is This Thing On? : Which Comes First? Reading or Writing? Which Comes First? Reading or Writing? I have an ongoing battle with myself. It’s called there are not enough hours in the day for all the reading and writing there is to be done. It’s always been an issue, but since starting my early morning writing ritual, it’s increased tenfold. As I said previously, I created a monster in giving life to my creative side. The need to write gets stronger every day. The only thing taking a close second to it is my love of reading. It makes sense right? I love words and stories, and reading the work of others is inspiring. Reading another person's work triggers a creative spark in me – it makes me want to write something equally amazing. Now. Obviously that feeling then disrupts my reading. So I go back to my writing, to getting the words down as quickly as possible. But, all too soon the call of my books comes back to me and I step away from the keyboard for a chapter, or two. And the vicious cycle continues. It doesn’t help that I’m a (slow) serial reader, typically having about four books going at once, along with an overstocked library just waiting for me to pick them next. (My book obsession has been chronicled before). Currently this is my reading stack. Now, before you start laughing there is a method to my madness in so many books. The book I read depends on the situation, locality, environment, and even my mood. Let me explain. Paper Towns is taking me so long because it’s on my Kindle so I need to be somewhere conducive to electronics. The Secret History I started back in June on vacation and I’m sooo close to being done. It’s an amazing literary read – translation: I need absolutely no distractions when reading it. So a crowded waiting room, busy coffee shop, or even my house sometimes, is not the place to read it. 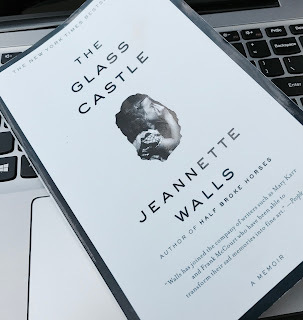 The Glass Castle I started two weeks ago. The book has been on my shelf for a couple of years now, but I was compelled to start it when I saw the movie trailer. I’m sorry it took me so long to start. Ironically I will probably finish this one first. (Confession - I wrote this last week and have since finished this book. Spoiler - the book was so much better.) The resiliency of this character has me mesmerized. It reminds me of Mary Karr’s The Liars’ Club, which I couldn’t put down either. Under the Tuscan Sun is my fun, escape read. Days when the pace of life is overwhelming, the 9 to 5 grind, suffering from technology overload – this is what I reach for. Maye’s description of her life in Italy renovating a Tuscan villa brick by brick makes me want to sell everything and book a one way ticket to Italy. I’ve taken to leaving for work a half hour early so I can stop for coffee and read a chapter. It’s like a decadent dessert I need to savor in small bites. The Awkward Path to Getting Lucky is a new release by a friend of a friend. I’m only a chapter in, but I can tell this is going to be my comic relief, which I think we can all agree we need more of right now. Lol - yes you did! I know you laugh at my overflowing bookshelves....you now see where it all comes from!